Our custom EABCO Accuracy Barrels® and E. R. Shaw Barrels for Savage 10/110 Series Rifles are so popular and easy to install. But until now, we could only recommend changing to chambers with the same sized bolt face as your original cartridge. For example, changing a .308 Win to a .260 Rem is a simple barrel change because the 308 bolt face and magazine are the same as the 260 Rem bolt face and magazine. But now, you can change to a completely different sized cartridge! 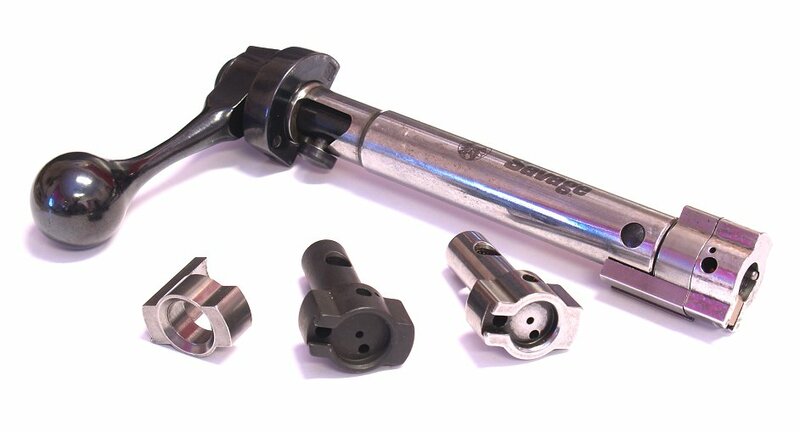 Within the limitations of long actions and short actions†, we can now convert your bolt face and magazine from whatever chamber you have to whatever chamber you want from our selection of EABCO and E. R. Shaw replacement barrels. (†Long action cartridges require long actions in order to fit magazines). Includes All Parts - The price includes all parts to convert your Bolt Face/Bolt Head plus gunsmithing service. Please allow 4-6 weeks for this service. All Original Parts Are Returned To You - You'll be able to easily convert your rifle back to the original bolt face, barrel, and magazine you started with because you'll have all of the original parts! I purchased the bolt face conversion service to convert my Savage 110 in .223 to a 264 Win Mag. I also purchased an E R Shaw barrel in 264. After the purchase, I got a phone call from EABCO recommending I send the entire rifle to them so their gunsmiths could to the barrel swap and mate the bolt face. So I did. Package deal. And what a great deal that is! Very satisfied with the entire process. Not to mention that the barrel looks great, bolt operation is smooth as silk, and rifle shoot very well!